The holidays can be stressful, so take some things off your plate and let someone else do the cooking! This time of year, there’s tasty options all month long (and into the new year) to accommodate every celebration. No matter if you celebrate Christmas or not, Christmas Day can be a great chance to treat yourself to some fine dining and a festive atmosphere. This holiday season; enjoy some of the delicious spreads available around the DFW. - The Pyramid Restaurant and Bar: The Pyramid Restaurant, located inside the Fairmont Hotel in Dallas, offers a Christmas Day brunch that sounds divine. Brunch includes, an omelet station with everything you could need for an omelet, sushi and seafood bar, traditional and carved items, and a pastry chef’s desert display. Guests receive a complementary welcome mimosa or glass of sparkling wine, and pay $65 for adults, $55 for seniors, and $30 for children 6 - 12 years (kids 6 and under are free!). Check out their website for brunch seating times. Not in the mood for brunch? 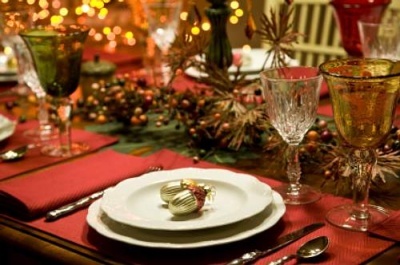 They also serve Christmas dinner featuring gourmet twists on traditional dishes! - Humperdink’s: Known for their “dude food”, this sports bar and pub opens Christmas day at 10am. For $19.99 customers can enjoy a Christmas Feast of turkey & gravy, house made stuffing, mashed potatoes, sweet yams, green beans almandine, cranberry sauce and choice of pecan or pumpkin pie! Stop by for a cold brew and a festive atmosphere. Want your feast cooked and ready for you to pick up? Humperdinks does take-out too! There are several participating locations across the DFW including one in Addison, Arlington, Central Dallas and Dallas at I-35 & Loop 12. - St. Martins Wine Bistro: St. Martins, located in Dallas, celebrates the holiday season by offering a Date Night Wine Dinner Special starting December 9th and lasting through December 23rd. Patrons are invited to enjoy a great evening of wine and feast including a four-course dinner featuring some delicious seafood options. Diners choose from a first course of either crab cake with tarragon aioli, or Seafood Newberg with scallops, shrimp, crawfish, and crabmeat. Second course offers choice of soup or salad, and entree selections include steak and lobster or pan-seared red snapper. At $85.00 per couple, this is a great opportunity to turn any night in December into a special occasion. (St. Martins also offers Christmas Eve, Christmas Day, and New Years menus). - Mignon: Mignon is a retro-French steakhouse in Plano that offers a special three-course menu on Christmas Eve and Day for $64.95 per adult. Menu offerings include lobster bisque, roasted Chilean sea bass, mint crusted rack of lamb, molton chocolate cake and more! There is something for everyone at Mignon, even if you aren’t in the mood for traditional holiday food. - Canary by Gorgi: Canary serves new Mediterranean gourmet food, and prides itself on an intimate atmosphere with only 10 tables available. From it’s location in Dallas, Chef Gorgi will serve Christmas and New Years three course dinners. Their special Christmas menu includes turkey or pork chop with pomegranate citrus sauce, pistachio fig dressing, mashed potatoes, and veggies. On New Years Eve they’re offering a menu that includes choice of prime tenderloin filet, wild caught salmon and shrimp, Colorado lamb and quail, and Texas wild boar and scallops. On both holidays, the regular menu will also be available, and prices on holiday dining vary. - Cru: Known as a hip destination in Allen to sample different kinds of fine wine, Cru also offers a Christmas Eve three-course dinner that sounds delicious. Diners choose from selections like pumpkin mascarpone ravioli, ahi tartar, filet mignon, braised Angus short ribs and much more. Decadent deserts such as crème brûlée and molten chocolate lava cake finish off the meal. At $40 per person, this romantic menu is perfect for a couple, or a group of friends celebrating together. - Jack’s Southern Comfort Pies: Jack’s serves updated southern comfort food classics, including some outstanding pies. Offering everything from braised brisket potpie and buffalo chicken potpie to pecan pie, this is the place to go for some cold-weather food to warm your bones! Order the pies online or by phone and they’ll be delivered to your door in a Pyrex plate, ready to serve. Helpful Tip: these also make great gifts! - Landmark Restaurant: The Landmark Restaurant in Dallas offers a Christmas day buffet with over 50 items for $60 per person ($24 for children). You’ll have a hard time choosing what to eat, with holiday choices of slow roasted turkey and gravy, seared rainbow trout, a seafood display on ice, seared pork tenderloin, honey glazed ham, omelets and much more! Bring the whole family to eat to their hearts content, and let the Landmark do the cleanup. They also offer special Christmas Eve and New Years menus, and have outstanding breakfast, brunch, lunch, and dinner menus available any other day this holiday season.